It is day two and all is well. Adrian and I just want to thank you for following and just keeping in touch through comments. I have been working 6 days and really haven't been able to visit like I want so I apologize. Well, it is my day to hold it down and I want to do this card in Adrian's favorite colors. Her card was just too too adorable yesterday. Thanks to Melissa, and that wonderful program "skype" we met and became "crafting sistas." Adrian you are awesome. Happy Blogaversary girl. Thanks for stopping by. Remember you can't win if you don't leave a comment. Adrians card to you was so sweet and this one is just as darling. Happy Blogaversary to you!!! what a sweet card!! love the color combo and the great silhouette image!!! Happy Blogaversary to you and Adrian!! Very cute card love the color! What an adorable silhouette, love it!!!!!! Cute card!! LOVE the silhouettes!! The colors so cute and so are the images! Love it! These are fabulous colors that always work well together. Congrats on 2 years. I have about 1 1 /2 weeks for mine. What a sweet sweet card! Two BFF in Black and white...I love those colours. TFS! Happy blogaversary! I love your card-the silhouettes are so cute. Ahh This is so beautiful Gloria.Love the sweet image.Beautiful sistas card.Congrats to the both of you. 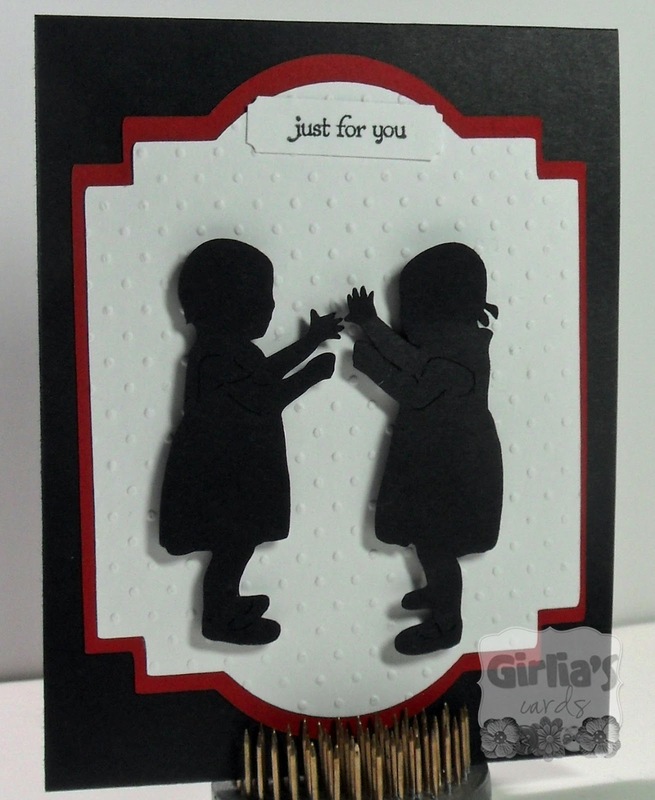 Cute card Girlia, I am sure she is lovin the card and colors, thanks for the shout out! This is soooo cute! I love how it is done in shilohets! Congrats on your blogaversary to both of you! I love the card. A child's year is oneof my caves! Gloria, this is really cute. I would love to give something like this to my sister. Your card is super sweet--I love A Child's Year cart. Great job!--Pat N.
This is so sweet! Great embossing! Aaaw, so cute The silhouette cut is adorable:) Love it! Aww! What a precious silhouette!! !